99bites: vegan eggnog cupcakes with dandies and spiced chai frosting! 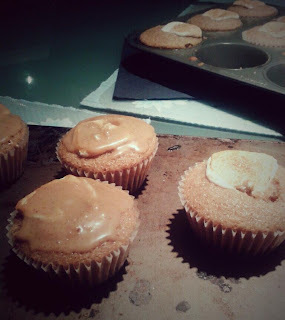 vegan eggnog cupcakes with dandies and spiced chai frosting! Diet failed. Time for some cupcakes instead! (Who cares about being healthy in the holidays anyway?) I decided to spent my whole afternoon baking, and made a crust as well as a frosting for these cupcakes, although I'm sure that either are omittable! Preheat oven to 350 degrees. In your food processor, grind the nuts, then add the remaining crust ingredients and process until it is like a paste. Push 1 or 2 tbsps of the "crust" into lined mini-muffin tins. Combine first 4 ingredients of the muffins in a small bowl, and combine the others in a large bowl. Whisk the wet into the dry (the mixture will be fairly runny), and add coconut flakes if desired. Spoon a little less than 1/4 cup measures of the mixture into lined muffin tins; add one marshmallow (or more) to each cupcake and cover with remaining mixture. Bake for approx. 15 minutes, until the cupcakes spring back at the touch and a toothpick comes out clean when they are poked. Be careful not to overbake; the crust may burn slightly (though it will not necessarily taste bad, it will be very hard). Meanwhile, prepare the frosting by combining all the icing ingredients in a blender, food processor, or electric whisk. When the cupcakes are cooled, use a toothpick to claw little wormholes through their middles and spoon the frosting into them, as well as glazing the muffin tops. Next, if you still have cupcakes left ( and haven't eaten them all up in the process like I did), eat 'em up! crunchy cauliflower and brussel sprout "chips"